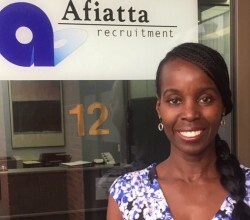 I am the founder of Afiatta Recruitment an Adelaide based recruitment business. Prior to this, I lived and worked in Hong Kong for 4 years where I started and ran my first employment agency. Born and educated in London, at the University North London, I hold a Business degree (Marketing). I am also a member of Toastmaster’s International. I am a trained Hairdresser and Make-up Artist and have worked as a model, on fashion shoots and TV commercials. I have also worked for Selfridges and Harrods department stores, as a Make-up demonstrator and as retail assistant working in fashion and fragrance. My approach to Image styling is to coach women who are either employed, seeking career advancement or new opportunities to reach their true potential. Let me guide you on your journey to corporate confidence and success.